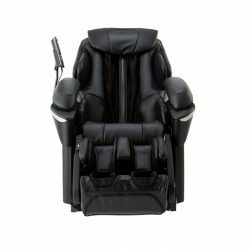 Note: The Panasonic EP MA73 Massage Chair has now been renamed to the Panasonic EP MA73K, or as listed on Amazon.com the EP-MA73KU – So that's the product that we have reviewed below. The Panasonic have been making massage chairs for decades, and they're known for their high quality products within this market. They are competitive with other high end retailers in the space like the Japanese giant Inada, and for some models, Osaki. 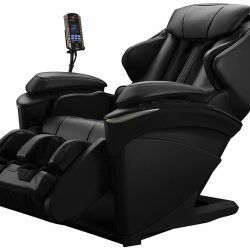 The EP MA73K massage chair from Panasonic is one of the higher end massage chairs on the market, and for those looking to get one of the best possible massage chairs around, this could be a great choice. Are There Any Problems With The EP MA73K Model? 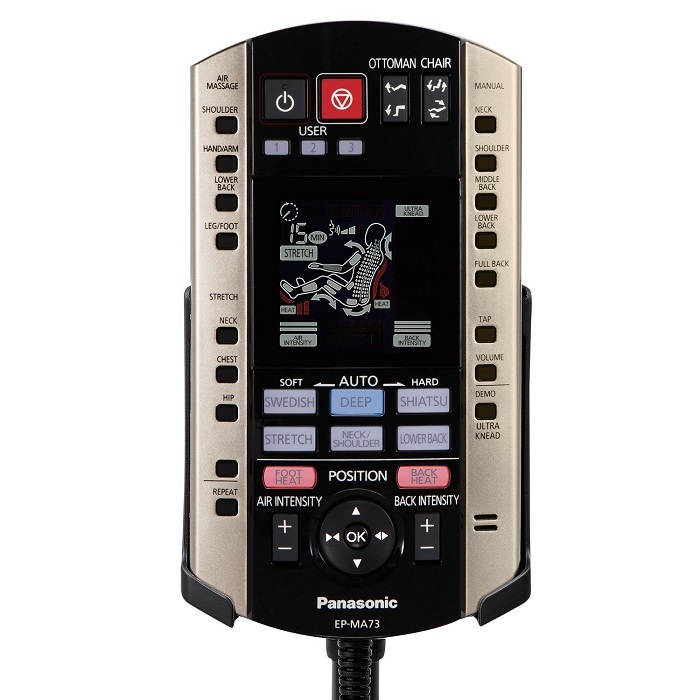 Unlike a lot of cheaper models, the Panasonic EP MA73K incorporates multi directional rollers, which are able to provide a “3 Dimensional massage experience” for the user. The Panasonic's high performance motors and multi directional rollers work wonders to get to all areas, and help improve muscle relaxation and blood circulation around the body. Their are 10 additional rollers that have the functionality to create a “Junetsu” like massage motion, using a very fine, and thumb-like circular “kneading motion”, which enables a much finer level of massage, and can provide even greater relaxation. It's the smaller and finer functionalities like this which make the EP MA73K a top of the range machine, and set it apart from the more introductory priced massage chairs like the Kahuna LM6800 Massage Chair and others. 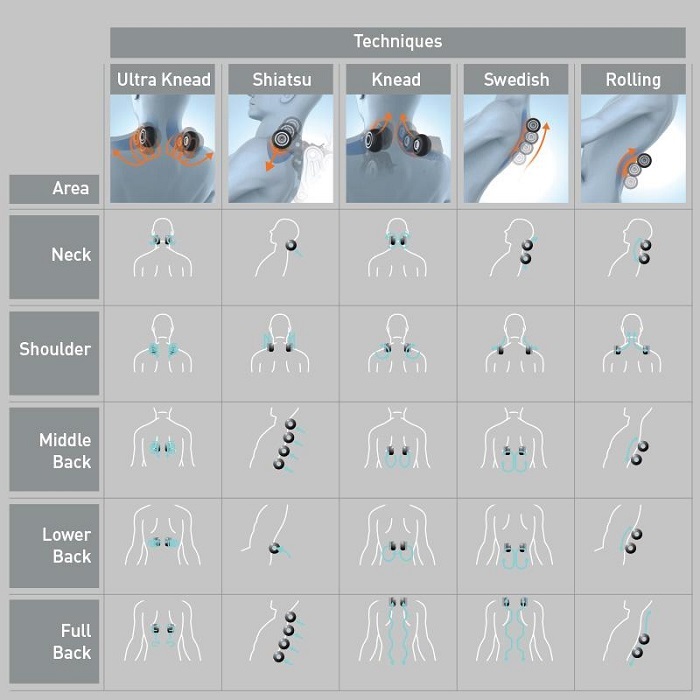 There are 6 automatic massage programs which cover the neck shoulders and lower back, and also can do the full back aswell. They include Shiatsu, Swedish, Stretch and “Deep”. There is also the option to use countless variations as well, so you certainly won't be hard pressed for choices when it comes to massage style and the preferred location. In the bodily areas of the back and feet, the rollers incorporate their own heating system, which adds a whole new level of possible relaxation and improved massage standard. These built in thermal rollers use their heat to help sore and tense muscles to loosen up and let go. The heated foot massage combines soothing pressure to really give your feet a deep relaxing squeeze and help you to really deeply let go. Many massage chairs out there incorporate air bag technology, but quite often this will be limited to only the arms and feet, and won't accommodate for the entire body. The Panasonic is different in that it allows for air bags in all of the areas of the palms, arms, shoulders, hips, thighs, glutes, calves, feet and legs. 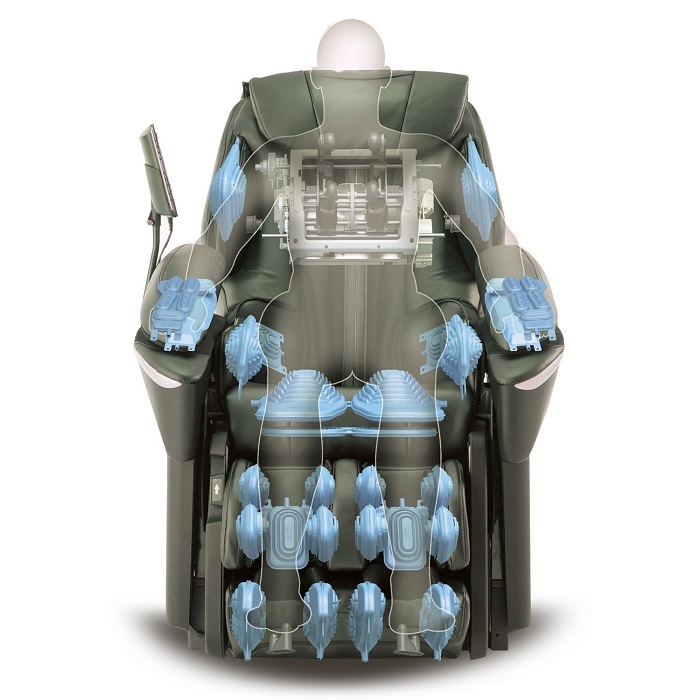 Each air bag can push deeply into the muscles, improving both circulation and flexibility. 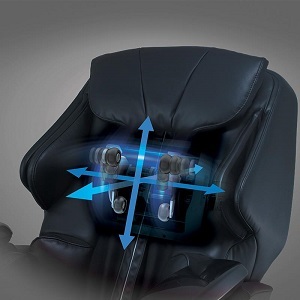 This a feature that you'll often see on massage chairs these days, and for good reason. Without the ability of personalisation, any massage chair is going to feel robotic and it's not going to be able to provide you with the personalised quality session that you really need, and is what you'd get from a real masseur. The Panasonic uses pressure senses to scan your body, and then sends that information to the computer to control the precision of the rollers, and give you a more unique massage experience. This is one of the features that really sets the Panasonic EP MA73K apart. Not only do you have all the functionality that we've covered so far, but the custom combination ability basically allows you to use that functionality in whatever combination you prefer. This is really powerful, and it basically gives you the ability to create a custom massage EXACTLY how you want it, using a certain style massage, on a certain bodily area! There's not many chairs on the market that will allow you to do this, and so we believe this to be one of the features that really makes this model from Panasonic worth the extra money if you can afford it! Interestingly Panasonic have chosen to go with the “Tethered” remote in this case, which is unusual in this day and age of “wireless appeal”. Pretty much everything is wireless these days. That being said, we feel this is a good approach in the design, because you really are never going to need to use the remote when you are not actually sitting or lying in the chair itself right? Why would you want it to be cordless/wireless, as then it's just another thing that can get lost. The remote control design itself is well thought out, with obvious layout, and single button pushes to control a large proportion of the chair's features. It's also an attractive design, which is pleasing on the eye. Using the custom combination options is probably where you are going to be the most button pushing you'll need to do with this remote control. At the time of writing, there are only 6 total reviews for this particular model massage chair on Amazon.com, so there's not a huge amount of data when it comes to feedback. This is probably due to the fact that the chair is in the higher price range, and basically a lot of people won't be able to afford a massage chair of this price. That being said, out of the 6 reviews, 5 out of the 6 people gave the chair 5/5 stars, with only 1 negative review having been left, which was a 2/5 star rating. Although this is pretty good, there's really not enough data to really get a great idea of the overall feedback, and so we'll be keeping an eye out for more reviews so we can update this section accordingly. Now, having said that, let's look at some of the specific feedback around this chair, based on the available reviews. First of all, one comment from a buyer said that they were on the 2nd one, that's how satisfied they had been with this model! Now, not everyone is going to have that kind of disposable cash, but it's certainly a good sign to see people buying more than just 1! Another positive that we could ascertain from the reviews, is that this chair has an excellent level of pressure ability. This is quite often something that comes up in the reviews of different massage chairs. The chair will quite often be either “too weak” for a certain person, or “too intense”. 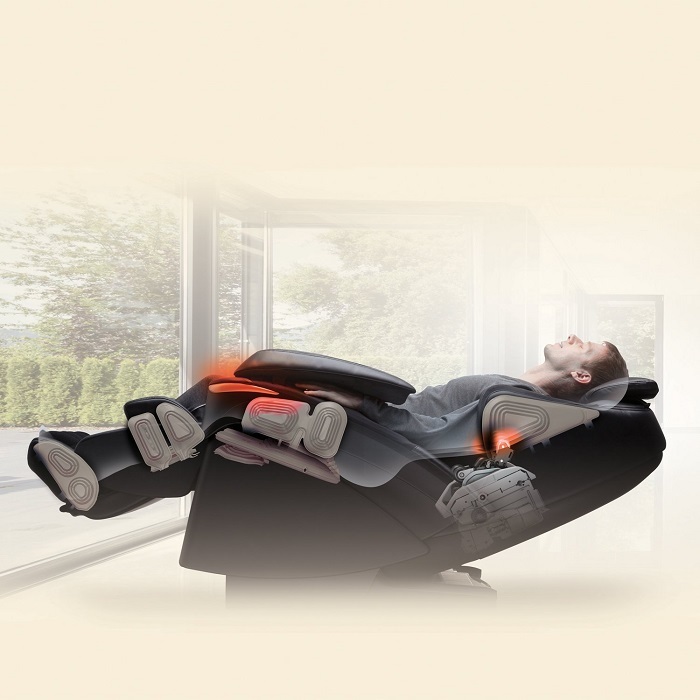 It seems that Panasonic have done a great job here with making sure that the chair is very flexible in its ability to provide different intensities of massage. Like any product out there, no matter the cost, it's pretty much impossible to achieve perfection. 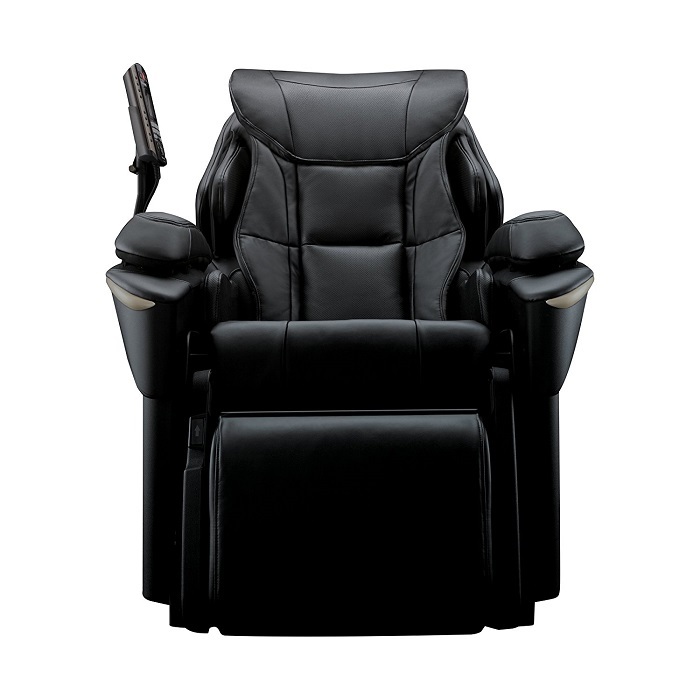 Of course, this massage chair from Panasonic is the same. It's not perfect. Although almost all of the feedback for this chair was overwhelmingly positive there were a couple of issues mentioned about it, where they felt the chair could have been designed/made better. One of those is the look, one buyer commented that whilst they absolutely LOVE the functionality of the chair, and its ability to provide an amazing massage, with a lot of options in intensity, etc, they found the look of the chair a little “ugly”. Obviously this is a little subjective, but it might be worth taking into account if you're really wanting to a have a chair that not only gives a great massage, but also looks cool and suites your already existing decor and furniture style. So obviously just looking at the images, and watching the video will give you a much better idea of whether or not this is a problem for you. The only negative review at the time of writing states that they experienced an error with the chair about 2 years after purchasing the chair, and had all sorts of negative experiences with the customer service at Panasonic to get the chair fixed. However, this negative review actually states that it was with a different model of chair, and they're not even talking about the EP MA73K, they're in fact talking about the “MA70” model. Not to mention this is only one negative experience, and it was 2 years after the purchase. Quite often we see one person complaining that the customer service is horrible for a particular purchase, but then you see lots of other people who bought the product giving the customer service glowing reviews. So this could well just be a case of “you can't please everyone”. Especially when it comes to buying very expensive products online, you want to be aware of 2 important factors. The first thing is, you want to be sure you are dealing with a company that has excellent online shopper security (shopping cart security). If you don't, then you could have to go through the painful experience of having your card details used by someone else without your permission, it's actually quite common. Ideally when shopping online, you'll use a card that's limited in funds, so even if this does ever happen to you, you will be minimising the risks. The other thing you want to be aware of is customer service. You want to try and buy items online from a reputable company that has great customer service. This is just in case there is a problem, you want to be dealing with a company who's customer service is going to be able to fix the problem quickly, politely, and as painlessly as possible. To help give you a further idea of how the EP MA73K will look and feel in real life, here's some video footage of the EP MA73 (which is very similar in look and function – as of writing there were no videos available of the EP MA73K). These chairs were initially made in Japan, but are now manufactured in China. It's still designed and engineered in Japan. What's the warranty like for this model? This model has a 3 year in-home warranty which covers parts and labour, and on top of that a 5 year parts only warranty is also provided. Is this chair FCC certified? Will this chair work for someone who's taller, like 6 feet, 4 inches? Yes, according to both the seller, and also from customer feedback, this chair will accomodate people as tall as that. If you're taller than 6 ” 4′ you may find that it's a little squished, but for most people it will be fine. Before I buy this chair, I want to try it live, where can I do that? Without knowing your location, that's a tough one to be able to answer, some customers commented they were able to try the chair in a local mall, etc, but it's impossible to give any specific advice on this. 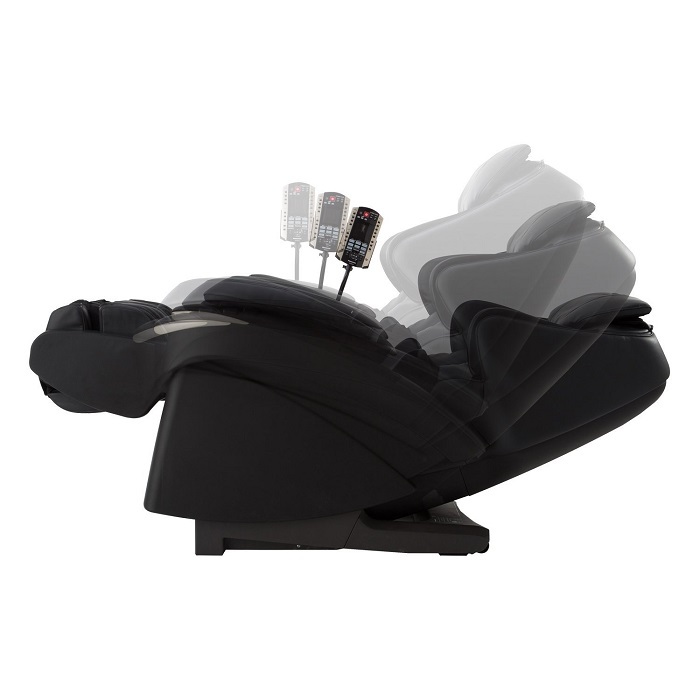 You could also try any local big electronics/furniture suppliers, as they may stock massage chairs such as this model. How loud is this massage chair? User reports suggest that this chair has some noise, but that it's not especially loud by any means, and in fact it's possible to fall asleep while in this chair (so it's obviously not that loud, though it would depend on your subjective opinion and sensitivity to noises of course). Can you get into zero gravity with this chair (as in knees above the level of your heart)? According to one users comments, this chair does NOT actually get to 0 degrees, but about 10 degrees short. Conclusion – Is The Panasonic EP MA73K Worth Buying? 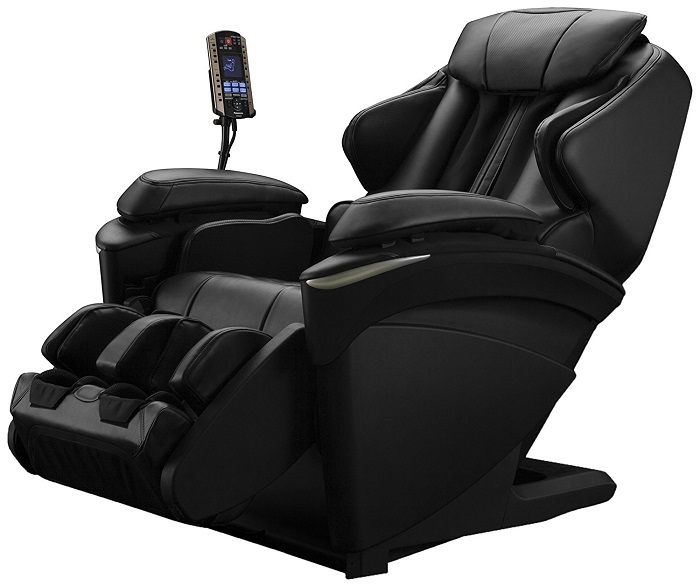 Overall, the Panasonic EP MA73K, previously known as the EP MA73 is a really excellent choice for those of you looking for a luxury massage chair that has powerful and hard to find features such as the built in Junetsu rollers, which are able to deliver much finer massages to smaller individual muscles, or the super POWERFUL custom combination feature of the chair which enables you to use all of the features of this chair in the most personalised way possible.